I decided to post the photo below because Joanna liked it and because I was encouraged to do so after reading a recent post at breathofgreenair. In a piece entitled Plockton High Tide Seonaid talked about ocean tides and how spring series’ were her favorite because they filled the bay at Plockton, allowing the reflected landscape to be painted upon the high water. I liked the phrase and the images, both literal and figurative. My own shore-side walk, along the shallows of Hospital Cove, began at 4:15 AM when Joanna nudged me to report that there was some nice color outside. Sunrise wasn’t due for another hour but the dawn of this particular day was more than worth the early start. Twilight followed and seemed to go on forever and sunrise itself put an end to the colorful warmth of daybreak. As the harsh white light intensified it illuminated the shallows through which I had been walking. Although there were denizens going about the business which would define their day, my eyes were drawn instead to the bottom and the patterns formed by cobble, pieces of broken shell, algae, and a host of tiny creatures. Perhaps the impression doesn’t translate well in the image, but this near-shore bottom looked like a mosaic to me. I watched as its component tiles changed form and position, slowly. Minute grains of sand flowed, chaotically, with the encouraging breath of the incoming tide. Larger grains progressed, as if along the teeth of a ratchet, two bits forward, one back … two forward, one back … toward the shore. Algae, dislodged, swirled in the current and eddies of moving fluid. Cobbles and the largest bits of broken shell formed stationary outposts in the ebb and flow of the changing tide. Hermit crabs and their brethren moved purposefully on their appointed rounds. What struck me, however, was that the assemblage seemed loosely coordinated. The submerged shoreline behaved as though it was alive. Like genuine organisms, the movements of my mosaic weren’t entirely predictable. A marriage of patterned activity and stochasticity, like so many gems in a child’s kaleidoscope. It was easy to walk through this changing landscape but required a good deal of concentration to stand, fully bent at the waist, to look with care. As details emerged from what had originally impressed me as a plain canvas I was struck with how the visual experience was paralleled by that which I have when viewing those infuriating stereograms (see a post from March of this year). When I first look at one of these I see nothing, save a nondescript profusion of color. 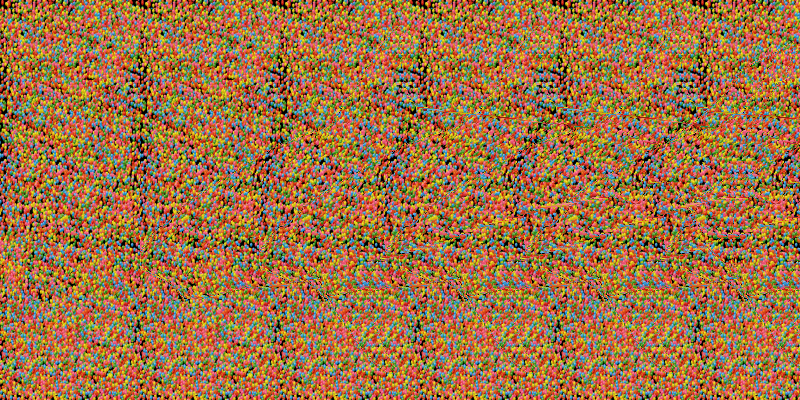 In a minute or so my eyes adjust and my brain is able to pick out the clues needed to construct a three-dimensional image (of a shark moving to the left, in the stereogram below) from two-dimensional data. 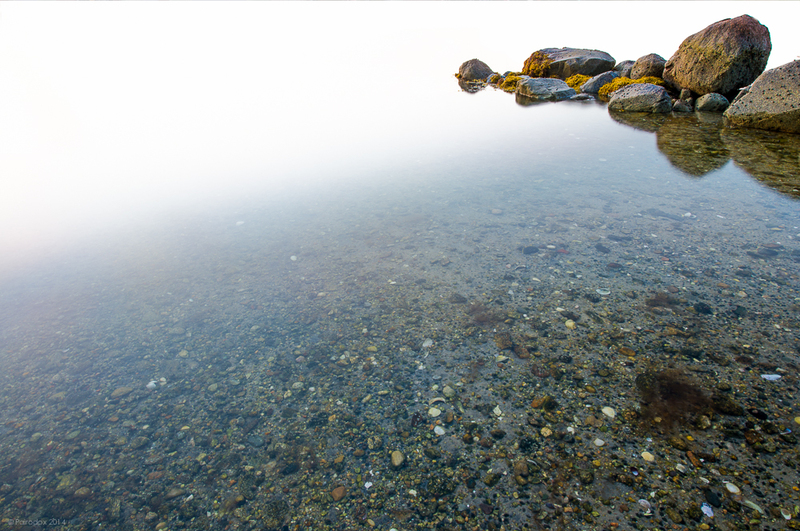 My mind worked in just this way when I peered into the shallows on this quiet, colorful, morning. In a way which I cannot fully describe, the myriad bits of information, like those hidden in the stereogram, coalesced to form a larger picture, my living mosaic, from out of an otherwise mundane collection of tiles. When I took the time to look I was able to eliminate the noise and allow the beautiful, living, image to float to the surface. Clicking either image will take you to a larger view.